Domestic or intimate partner violence may be one of the most widespread criminal offenses in America. Yet it is consistently one of the least reported. Although most abuse victims are female, there is no typical victim. Domestic violence affects people of all ages, races, religions, income and education levels. Although a lack of reporting makes statistics hard to gather, a 2008 study conducted by the American College of Obstetricians and Gynecologists reported that about 35% of women who go to emergency rooms are thought to be victims of abuse. The study also concluded that 1 out of 3 women murdered in this country are victims of domestic violence. That’s an alarming figure. Now imagine what domestic violence looks like through the eyes of a child. Meet Ms. Glenda Cook. Glenda is a remarkable woman that has taken the traumatic and terrorizing experiences that she lived through as a child and turned them into something good to help so many others in need. As a child, Glenda recalls how she and her siblings would listen helplessly at screams from her mother in another room. They knew that her stepfather was beating their mother again and just waited for the screams to stop. The screams stopped the night Glenda actually witnessed her stepfather kicking her mother as she lay on the kitchen floor. Still feeling helpless, and now traumatized, Glenda called 911 but was petrified to the point that she could not utter a single word to the operator. Fortunately, the operator could hear Glenda’s mother’s screams and sent police right away. Today, Glenda’s mother is a healthy and happy survivor. A native of Detroit, Michigan, and a single mother of a 7-year-old, Glenda is a 1993 graduate of The Academy of Court Reporting and Technology Paralegal Program in Southfield, Michigan. After graduating from paralegal school, Glenda interned at Wayne County Neighborhood Legal Services and the Women’s Justice Center working in family law. It wasn’t long before her love for family law and serving her community was born. Unfortunately, as legal services projects were usually funded by grants, when the funds for the grant work were depleted, so was Glenda’s position. As a result, Glenda looked for more settled positions and ended up doing corporate work for a debt collection company in order to provide for her family. It did not take long for Glenda to realize that she was not cut out for corporate work. Glenda did not enjoy taking people to court for money that she knew they did not have. 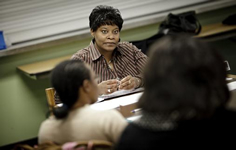 Corporate work was not her niche, and after two years she found herself at the YWCA where she currently works in conjunction with the Detroit Police Department’s 12th Precinct Domestic Violence Unit, assisting countless victims of domestic violence in finding safety and shelter. Glenda also assists victims with court appearances and counseling on a daily basis. I’m happy to report that this hero’s extraordinary efforts have not been overlooked. In recognition for her selfless service to her community, Allstate Insurance flew Glenda and her son to Atlanta, Georgia, for the weekend prior to the King holiday. On January 17, 2011, Glenda Cook was one of only four Americans to be recognized and receive the Allstate Insurance Annual “Give Back Day” Hero Award. The Hero Award was established to recognize and honor everyday people that transform into heroes that make a difference by giving back to the African American community. When I asked her how it felt to receive an award in Dr. King’s honor, Glenda said,“I still haven’t come down yet. Being in Atlanta with the other heroes to interact with and just to feel their energy about how passionate they are about their different programs and projects, I was over the moon.” Glenda went on to tell me that since leaving Atlanta, she and the other award recipients remain in contact, networking, trying to figure out how they are going to bring their messages to the community and actually get people to listen. Glenda’s message to her community is to “Always be willing to speak up and speak out.” Even after the national recognition, Glenda admits to being disappointed when she returned to Detroit that following Monday. She said that since her fight against domestic violence had made the front page of the Detroit Free Press and since she was interviewed by two local television stations, she just knew that once she returned to work that the phone would be ringing off the hook. To her surprise, there were no calls from victims or people wanting to join her in the campaign against domestic violence. Glenda went on to tell me that despite all of her efforts, domestic violence is still that subject no one really wants to talk about. According to Glenda, her training as a paralegal has proven to be invaluable throughout her professional career. While working in family law, Glenda drafted legal documents like divorce complaints and restraining orders with very little direction from any attorneys. She explained that “the 3rd Circuit Court teaches you how to be a really good paralegal because when I started out in ’93, I didn’t have anyone to hold my hand. They literally just threw me into it. There was no learning curve.” Whether it’s the attention to detail required to complete court forms, understanding how the laws work and how to stay current with the laws, or interacting with officers of the court and interviewing witnesses, Glenda credits her paralegal training for much of her career accomplishments to date. I must admit, when I was first approached by Chere Estrin [Editor-in-Chief of KNOW Magazine] to do a story on heroes in the field, I thought to myself, “Where in the world would I find this Super Paralegal?” I looked around in the pool of peers and mentors that I have worked with throughout the course of my 22-year career. I came up with a list of people that I respected, admired, and even looked up to, but no one that I personally knew was really doing anything deemed heroic (at least not in public). Next, I checked the dictionary and thesaurus and came across terms like “mythological,” “noble,” “conqueror” and “idol.” Not exactly what I had in mind. Apparently, when people hear the term “hero” they often think of some legendary, illustrious character that spends his or her days fighting villains. Others may think of a hero and envision someone in uniform, a soldier or fireman, risking it all to help a stranger. However, after learning about Ms. Glenda Cook, I’ve come to realize the true meaning of the term “hero.” Heroes are just ordinary people who do extraordinary things. Copyright 2011 KNOW, The Magazine for Paralegals Reprints by permission only.